First off I must thank my wife, this tasting plus the upcoming Dogfish Head Dinner was a fathers day gift. Do I have the best wife or what!? The Extreme Beer & Extreme Cheese pairing was at Amanti Vino in Montclair, New Jersey. To quite honest, I was a bit skeptical at first not knowing much about the store, except they carry a hand selected wines. When I got to the store and saw the selection of beer they had, I was encouraged. It was a very small selection of beer, but it was a section of top notch imported and craftbeer. I was shocked when I saw they had the Dogfish head Sah’Tea. I had not seen it anywhere and just that morning I had heard stores complaining on twitter that they hadn’t received it. Now I was excited. 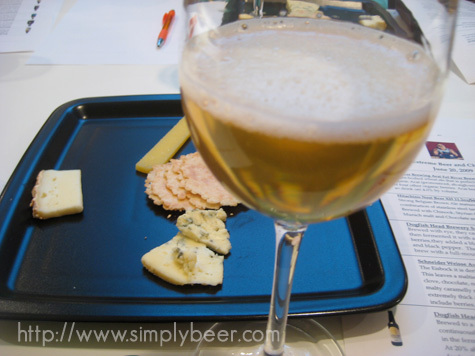 The idea of this class was to introduce people to extreme ways of making both Beer and Cheese by sampling the final product. The first beer was the Eel River Acai Berry Wheat. This organic beer is made with Acai berries from the Brazilian Rain Forest. At 4%abv, it was the smallest and the only “session” beer of the night. I was disappointed with the head on this beer, as a wheat beer it should have a massive/substantial head to it. The aroma was slightly fruity, nice subtle flavors. The berries were present in the beer but not overwhelming. I thought much of the wheat characteristics of the beer were lost, no mild hop bitterness or spiciness. Not a bad beer, but my least favorite of the tasting. This Beer was paired with the Buffalo Tallegio, a very unique cheese made with water buffalo milk. I never knew water buffalo were milked, I learned something new! The Hitachino Nest Beer XH was next. For me, this brewery has been hit or miss, loved their Espresso Stout, hated the White ale and Weizen. Even with the bad experiences with a brand of beer, I always try to keep my mind open to the other styles from that brewery. The XH, is a Belgian Dark Strong ale which was aged in Shōchū (distilled sake) casks for 3 months. This beer was a reddish hazy brown, looked unfiltered; the aroma was earthy, oaky with a hint of alcohol. The head on the beer was dense and creamy looking with some nice lacing. The flavor was pretty much spot on with the aroma, earthy, oaky with hints of alcohol mixed with caramel and yeast. The back end finished nicely with a mild hop bitterness. I thought it was a great beer, good aroma and flavor. This beer was paired up with a hard cheese I very much enjoyed with the beer, Hirtenkase, made in Southern Germany with unpasteurized cow’s milk. The one beer I was looking forward to when I saw the menu, Dogfish head Sah’Tea. Having seen the video of how this unique beer was made, I’ve been waiting for it to hit the stores for quite some time. 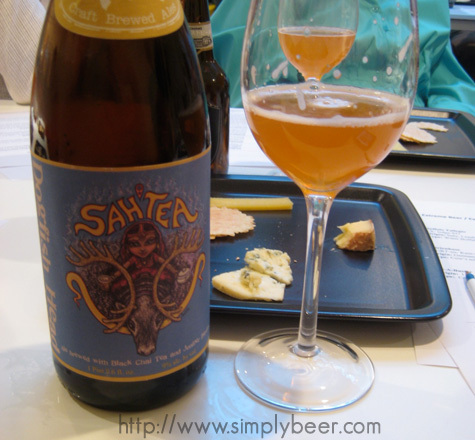 The Sah’tea poured a hazy golden color with a fairly thin head, but was able to get some back by swirling my glass. The aroma on this beer was amazing, so many smells playing with your nose – cinnamon, cloves, ginger, and that distinctive juniper aroma was under it all. The taste was just as complex hitting all those same flavors plus some nice sweetness, probably from the write hot river rocks being added to the brew tank, caramelizing the sugars. I don’t believe there were any hops used in this beer, giving it a sweet instead of a typical bitter finish. Excellent Beer!!! I’m curious as how long this beer can age, since there are no hops (I know of), which are a preservative, but the abv is 9%. I would imagine the subtle spice flavors would be gone in 9-12 months. Next was the Schneider Weisse Eisbock or Ice beer. 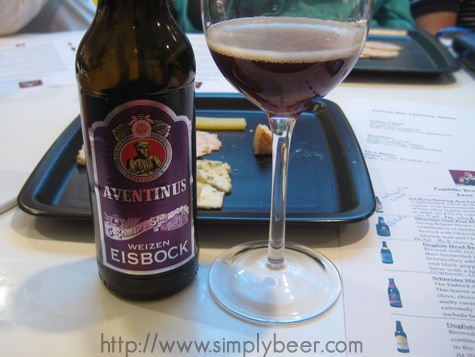 Basically, the Aventinus Doppelbock is run through frozen pipes , the icing of the water in the beer concentrates the beer leaving a more malty and high alcohol beer. At 12% abv this is a big beer, a strong alcohol and nutty banana bread aroma right off the bat. The beer, itself, is a hazy dark brown and the flavor has all the notes of the aroma along with a mild chocolate flavor. This beer wasn’t paired with any cheese, but I thought it when well with the Buffalo Tallegio and Hirtenkase. 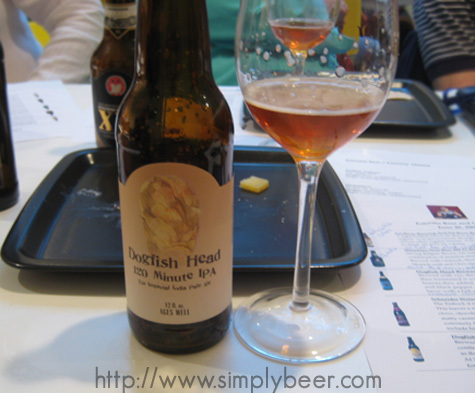 The final beer of the night was the craft beer cult classic, the Dogfish head 120 minute Imperial IPA. Basically if you have not had this beer, it is something you need to have just once in you life. It drinks like a carbonated port. at 20%abv and 120 IBU’s this is a monster of a beer. It has lots of sweetness that balances out the alcohol making it a very pleasant, sweet beer to drink. It is just a fabulous beer! This was paired with a Smokey Blue. I’m not a fan of blue cheese, I preferred the beer with the Tallegio. This was a great pairing, an excellent job of explaining the beer in simple terms to the people there. I was impressed by Travis knowledge of the beers he was serving and the over friendliness of the store. Amanti Vino will be come a regular stop for me on my beer buying binges! Falling On the Wagon, Alcohol Free could you do it?